A story of perseverance — that of a player and a team — finally paying off. Perseverance. Some people have it. Avery Johnson had it in spades. His story is not as glamorous as other NBA stars. But Johnson was in the right place at the right time, and he rose to the occasion. Johnson had a successful run at St. Augustine High School in New Orleans. The Purple Knights went undefeated in his senior year, winning a state championship. But then Johnson attended three colleges in four years, which set the tone for his NBA career. In his senior year at Southern University, Avery led Division I averaging 13.3 assists per game, an NCAA standing record. To this day, Johnson is the only NCAA Division I men’s basketball player with multiple 20+ assist games. He had 1 in 1987 and 3 in 1988. His on-court ability and leadership skills were shaping up, but it was not enough to get him to the NBA. He went undrafted in 1988 before signing with the Palm Springs Stingrays of the now defunct United States Basketball League. A year after playing with the Stingrays, Johnson made his NBA debut with the Seattle SuperSonics. The following season, he was traded to the Denver Nuggets before being waived on Christmas Eve of 1990. Johnson’s positive mental attitude, even in the midst of disappointment, would carry him through his entire career. He knew he was NBA material and that confidence sustained him. His first run with the Spurs began in January 1991 with head coach Larry Brown. 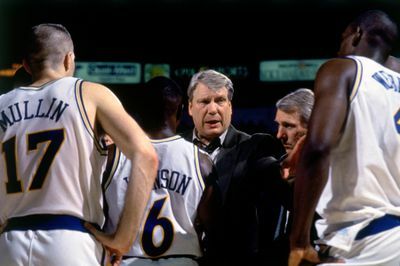 Gregg Popovich was serving as an assistant coach for Brown and Pop saw in Johnson “a rare understanding of the game and innate leadership skills.” During this time, Johnson wore the jersey #15. Despite the connection with the future Spurs head coach, Johnson’s stint with the Spurs would end on December 17 after 67 games in two partial seasons. Johnson would rejoin the Spurs on November 19, 1992 as a starter, and this time as #6, the number to which he would be most famously associated. Up until then, very few players had worn the now retired #6- Alfredrick Hughes whose sole NBA season would be with the Spurs, Walter Berry who struggled to get along with Larry Brown during his tenure, Jerome Whitehead who wrapped up his career in San Antonio averaging 3.2 points, and Trent Tucker who played 24 games for the silver and black in 1992. The path was clear for Avery to make #6 his own, he just needed the right mentor to shape his development. Although the season started with Jerry Tarkanian as head coach, Tarkanian did not last the season. John Lucas II took the reins for the remainder of the ’92-’93 season. Alas, Avery would again be let go at the end of the season. He would make a move to the Golden State Warriors under head coach Don Nelson. Assisting Nelson was none other than Gregg Popovich, who was sure that Avery was ready to be a starting point guard. In addition to the 70 starts with Golden State, Johnson served as the Warriors captain just days after arriving. Here is where Johnson’s career appears to have come into focus. The summer of 1994 brought Gregg Popovich back to the San Antonio Spurs, but this time as general manager. With one of the most dominant centers in David Robinson, rebounding legend Dennis Rodman, and the triumphant return of Sean Elliott, the pieces were almost all in place. Pop made a call to Johnson and asked him to come back to San Antonio specifically with the goal of getting the Spurs to the Finals. From 1994-2001, Johnson developed into “The Little General,” a counterpart to David Robinson’s “The Admiral” (which in itself is humorous as Robinson ranked as high a Lieutenant Junior Grade, but who wants a t-shirt that says that). “Little” because of his unconventional 5’10” height and “General” because of leadership as a point guard. Avery’s positive attitude, grit, and determination were a perfect match for Robinson, Elliott and the culture that was taking shape under head coach Gregg Popovich. In fact, it was Avery who came to the defense of Popovich during the firing of Bob Hill, a controversial decision at the time. But Johnson believed in Pop the way Pop believed in Johnson. And mutual respect was just the beginning. With Pop now head coach, Johnson began to flourish. The Little General was running the floor. Johnson designed the spacing and pacing, while all his teammates benefited from his ability to work himself into the paint just as readily as he could feed the shooters. He could shake his defender and moved well without the ball. Yet Johnson was not limited to athletic vision. He clearly saw the path to a Spurs championship. The ’96-’97 season saw David Robinson play 6 games. The rest of the season, the remaining Spurs were left scrambling in a feeble attempt to keep the ship afloat without The Admiral. The result was a 20-62 record, the worst in Spurs franchise history. But a historically bad season led to a historical recovery. The end result was the first overall NBA draft pick, Wake Forest sensation Tim Duncan. 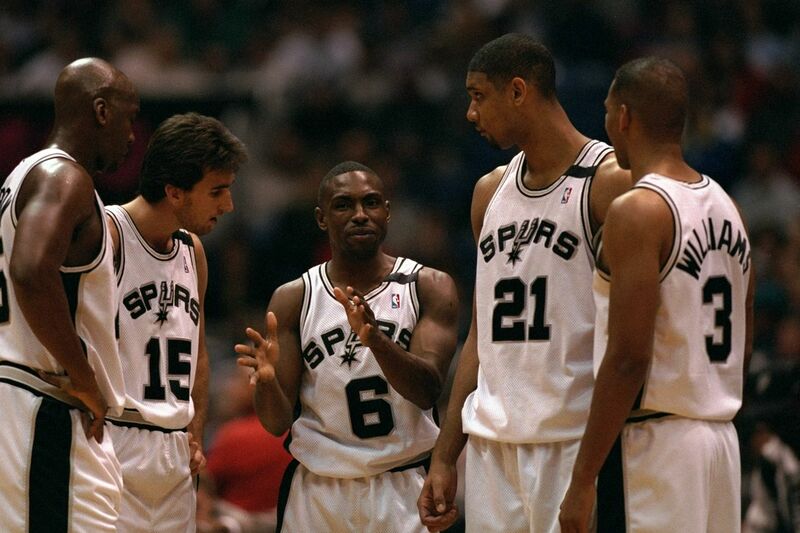 The following season, the Spurs would for the 2nd time record the biggest turnaround in NBA history. The Spurs, along with Tim Duncan, went 56-26, winning 36 more games than the prior season. Alas, the season ended at the hands of Karl Malone and the Utah Jazz in the Western Conference Semifinals. 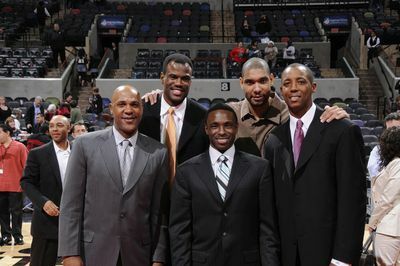 Johnson recalled a conversation he had with David Robinson in which they agreed that the Spurs must win a championship, or else they risked losing Tim Duncan when his rookie contract expired at the end of 2000. The shortened lockout 1999 season increased that pressure. A 6-8 start didn’t bode well and rumors that Gregg Popovich’s position as head coach was on the chopping block did not increase the likelihood of the season turning. But Johnson, once again, faced the odds with his best smile and endless tenacity. For the remaining 36 games, the Spurs won 31 and earn themselves the top seed going into the playoffs. Johnson led the Spurs in assists with 7.4 per game, 5 more than the next Spurs assist contributor. He was also only one of two Spurs to average more than 1 steal per game. The silver and black found their rhythm and fortitude when they met the Minnesota Timberwolves in the first round of the playoffs. Their lone loss in the series exposed the chinks in their armor, but it facilitated an all-out team effort. 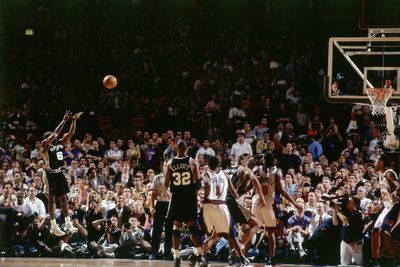 A 4-0 sweep of their nemeses Shaq, Kobe, and the Los Angeles Lakers focused their belief that a championship was in fact a reality within their reach. That momentum continued in the Western Conference Finals with a 4-0 sweep of the Portland Trail Blazers, landing the Spurs in their first ever NBA Finals appearance against the Eastern Conference Cinderella team, the New York Knicks. Throughout the playoffs, Johnson continued to lead the team in assists and wreaked havoc with steals. His ability to create on the floor in multiple ways directed the Spurs. The give-and-go, kick out, no-look passes, long twos, occasional threes, fast breaks —The Little General stepped up everywhere he could— including cementing the Spurs’ first ever NBA Championship in Game 5 of the Finals. From his humble beginnings to a game winning shot in front of a Madison Square Garden crowd, Johnson persisted throughout his career. Statistically speaking, Johnson’s career paled in comparison to the careers of his teammates; but it cannot be denied that his contributions were essential to the Spurs and their first championship. For a small market team from the ABA, an NBA Championship had been a long shot. And for a 5’10” guard from 3 colleges, a starting position on a squad in the Finals was also a long shot. The Spurs and Johnson were a match, a true David and Goliath parable, and the one thing in common with both- Gregg Popovich. Popovich’s belief in Avery when teams were cutting him married with his vision for the Spurs while facing insurmountable odds, his transcendent longevity, and his shrewd capability to elicit his players’ finest all brought on the culminating celebration on the Riverwalk on June 18. The Spurs were the first ABA team to win an NBA Championship, and that makes Johnson’s jersey retirement even more fitting. What could be more Spursian than to celebrate a team player who exhibits leadership while supporting the greatest players to ever step onto the hardwood, all the while contributing to a legacy of greatness powered by selflessness, teamwork, and loyalty? It is fitting that Johnson’s number was retired on December 22, 2007, considering December had been a rough month for Johnson in years past. But that’s what makes The Little General’s tale unique. This story could not have taken place in any other city. The retirement of #6 could never have happened in Los Angeles. Can you imagine the Lakers retiring Derek Fisher’s number? He just doesn’t fit in the lore of a team that can expect to have at least one extraordinary talent per generation who’s dying to come to a big market. That’s what makes San Antonio special, and what made Johnson such a great fit. The Spurs experienced a team effort en route to the Finals that laid the foundation for two decades of consistent greatness and 4 more NBA Championships to come. Avery Johnson is the embodiment of the Spurs way with a reassuring smile throughout the monumental rise from contender to champion.